I love nachos loaded with the works, but they can sometimes be complicated. When you get a big plate of nachos in front of you, it is more than likely that you are going to come to a point where there are plenty of chips left, but no delicious topping. In addition, have you ever tried to serve nachos at a dinner party? They aren’t easy to eat or serve because they are fairly sloppy and difficult to eat. Is there a way that nacho lovers can enjoy their favorite treat in a way where every chip is loaded and they aren’t spilling topping all over themselves? Nacho lovers can rejoice, as these Loaded Nacho Bites are the exact solution. 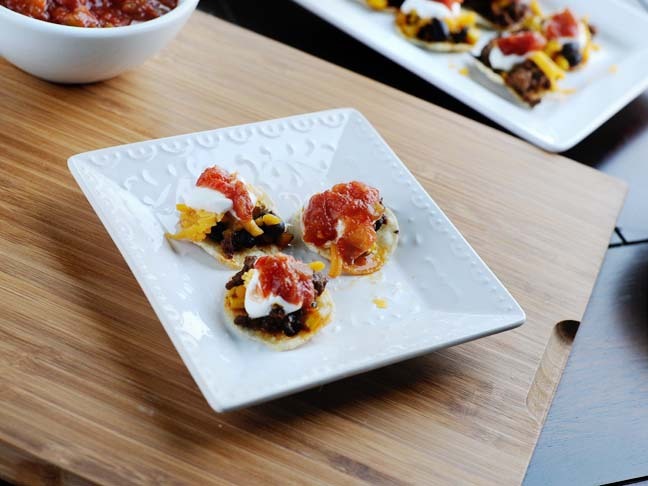 Simply place your nacho toppings on individual bite sized chips and you have a bite size appetizer that turns loaded nachos into a sophisticated appetizer! Place chips in a single layer on a large serving platter. In a small bowl, combine taco meat and black beans. Top with finely shredded cheddar cheese, a small dollop of sour cream and ¼ teaspoon salsa.